LJ Idol Week 6: "Sunrise"
My great-grandfather died before I was born, but my mother always told me the story of the rooster that he owned when she was a child. (And yes, for those of you who are wondering, Pepita is his namesake). Panel 1: The sun is rising. There are four houses. The first three all have smoke rising from the chimneys. The sounds of roosters crowing come from the first three houses. From the first house, though, comes the sound of snoring. And a shout. Panel 2: Josephine, looking angry. Panel 3: Alberico is sound asleep and snoring. 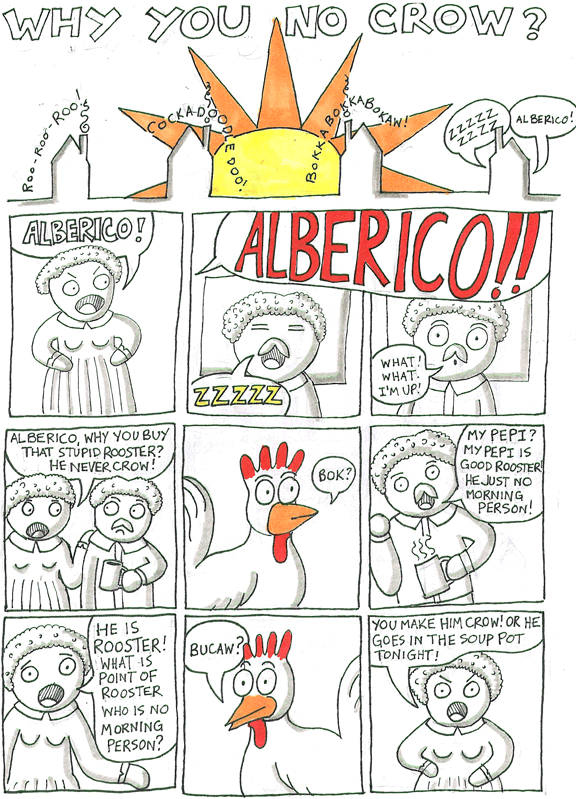 Panel 4: Alberico is startled awake. Alberico: What? What! I'm up! Panel 5: Alberico is out of bed, with a cup of coffee in his hand. Josephine has her hand on his shoulder. Josephine: Alberico, why you buy that stupid rooster? He never crow! 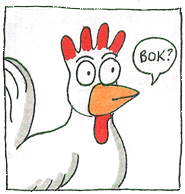 Panel 6: Pepi, the rooster. Panel 7: Alberico, looking offended as he drinks his coffee. Alberico: My Pepi? My Pepi is good rooster! He just no morning person! Panel 8: Josephine looks distressed. Josephine: He is rooster! What is point of rooster who is no morning person? Panel 10: Josephine looks angry. Her hands are on her hips. Josephine: You make him crow! Or he goes in the soup pot tonight! Panel 11: Alberico pets Pepi, coffee still in hand. Alberico: Pepi! Pepi, you hear Mamma? If you no crow, she boil you to death! Panel 12: Pepi puts his beak in Alberico's coffee cup. Alberico: This is very serious! How I make you crow? Panel 13: Close up of Pepi drinking Alberico's coffee. Alberico, from offscreen: Ah! You want some coffee! 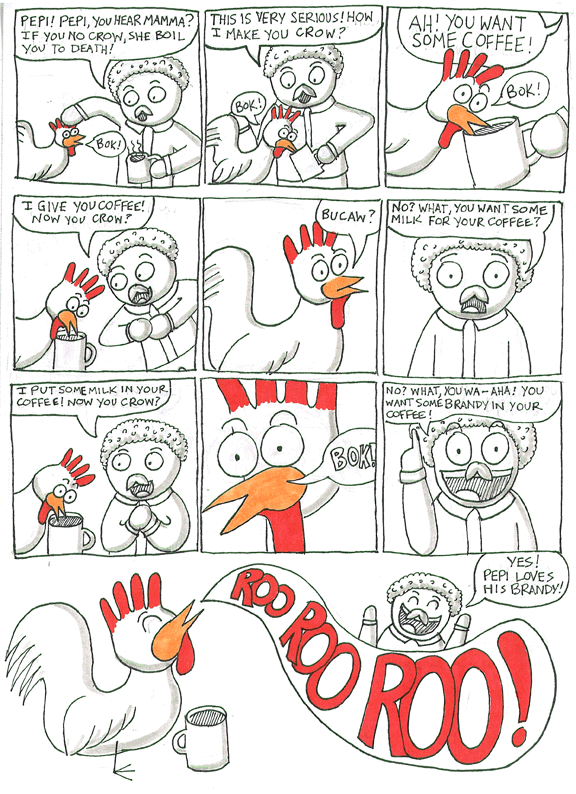 Panel 14: Alberico has set the coffee down in front of the rooster, who is drinking it. Alberico: I give you coffee! Now you crow? Panel 16: Alberico, looking distressed. Alberico: No? What, you want some milk for your coffee? Panel 17: Pepi is still drinking the coffee. Alberico: I put some milk in your coffee! Now you crow? Panel 19: Alberico, looking inspired! Alberico: No? What, you wa-- Aha! You want some brandy in your coffee! Panel 20: Pepi is crowing loudly, as Alberico looks on happily. Alberico: Yes! Pepi loves his brandy! Also: A note to Idolers and friends who may not have seen it: I would like your addresses to send out holiday cards and do a comic project by mail. LMAO! Booze the cure all for everything! It is! After that, my great grandfather insisted on giving the rooster coffee with brandy every morning to make him crow. Perhaps I would feel more awake if I had brandy in the morning. I think we all would! I am honored to almost share a name with such a smart rooster. As well you should be! He is a very smart rooster! I, for one like how your ambitions are growing! And I want brandy in the morning too, that sound like the smartest idea. Thank you! I am worried that I'm not going to be able to keep up with myself-- I usually don't have time to do this many pages for one entry. And yes, he was clearly a smart rooster. That is why Pepita is just like him! It does indeed! Thank you so much! He was a very smart rooster! Thanks! Thank you so much! I have so much fun making them. Thank you! It is one of those stories that needs to be told! Aw! I think I love Pepi! Smart bird, that one, to get brandy in the morning. Heck yes! He is proof that chickens are noble and intelligent creatures, unlike modern science would have us believe! I wish I had known him! Really? That is awesome! I want a rooster but out property isn't zoned for one. Now that is an awesome story!!! My family is a veritable font of awesome stories! Cute! I could really see this happening in my head! Thanks! My mom actually drew a picture book of it and gave it to my grandmother one year for Christmas. Hers is more serious and less funny though! That is hilarious. Your great-grandfather actually fed brandy to a rooster to get him to crow to stop him from being dinner?! Yes! He did! And from then on he totally kept giving Pepi coffee spiked with brandy EVERY MORNING. I absolutely loved this one. You have a real talent.